If you have details, I’m sure some of our readers would love this location. Plum trees, planted on sidewalks and in landscaped areas, are starting to bloom in San Francisco. I took this shot early this morning on Mariposa St. outside St. Gregory Nyssa church. Prunus cerasifera, known as the cherry plum or purple-leafed plum, can be seen throughout the city, many of them planted by Friends of the Urban Forest or by CalTrans. Oyster Point [map] in South San Francisco on a hazy Sunday morning. The San Francisco Bay Conservation and Development Commission has approved ferry service from Oakland to Oyster Point; service could begin as early as late 2010. The new route is only one of several planned, using new, greener vessels, in an expansion of commute options in the next few years. (Did you know there was something called the Water Emergency Transportation Authority [WETA]?) See all the proposed routes. Detail of mural on 13th St. and Bernice St. [map] across from Rainbow Grocery. Click the image for a Google Street View showing a wider swath of the mural. Last Saturday, Dolores Park was home to the 9th Annual Expo for Independent Arts; this Saturday, the park will be home to an event for those more interested in art-as-performance than art-as-object. It’s Improv Everywhere’s Mp3 Experiment San Francisco. Beginning at 2:00 and running no later than 2:45, a huge crowd of people will converge on the park and follow instructions given by the voice in their heads. Best of all, you can be one of them! See the page for detailed instructions, but here’s how it basically works: you download an mp3 to your mp3 player and sync up your watch to their page before leaving for the event. At the appointed time and place you press “play,” and follow the instructions along with everybody else. Some videos of past events can be viewed here. Improv Everywhere has a note about cameras: This is a participatory event. We encourage participants to leave their cameras at home and have fun participating. Same goes for the media. Let’s all enjoy the moment and resist the urge to document! That makes perfect sense for the participants, but the media? Sorry folks, but knowing journalists, that’s the exact kind of request that will guarantee the presence of at least one camera crew. Of course, maybe that’s what Improv Everywhere wants. They are rather devious folks, after all! This Saturday the 27th, the San Francisco Film Society and the Presidio Trust are co-presenting the seventh annual Film in the Fog. This year they’re screening Vincente Minnelli’s 1951 film, An American in Paris, starring Gene Kelly and Leslie Caron. It’s a free outdoor screening on the lawn at the Main Post Theater in the Presidio (99 Moraga Ave), right near where they did Shakespeare in the Park weekend before last. The screening will be preceded at 5:30 by live entertainment from Pi Clowns: The Physical Comedy Troupe, and the screening itself will start at 7:00 with a vintage cartoon and newsreel before the feature. Quoth the Presidio Trust: “Bring a blanket, low lawn chairs and picnic under the stars! Food and drink from the Presidio’s Dish Cafe and Acre Cafe will be available for purchase.” Quoth the Film Society: “As always, it gets a little chilly in the Presidio this time of year, so bring warm clothes and blankets to sit on.” Quoth me: “Brrr!” And anyway, how can you picnic under the stars when the fog is obscuring them? Well, maybe we can give them that one. After all, it might be clear out. It’ll be a hot one today, ladies and gentlemen, and hotter tomorrow, due to that late-summer east-wind thing. In the worst case, wildfires will destroy several thousand acres in the East Bay. In the best case, the only burning will be in Dolores Park — sunburning, that is. If you’d rather get sunburned standing up than lying down, there’s bicycle racing in town today as the Giro di San Francisco (which is Italian for “Tour de San Francisco”) goes until 4:00 pm. The race’s epicenter is Levi’s Plaza. 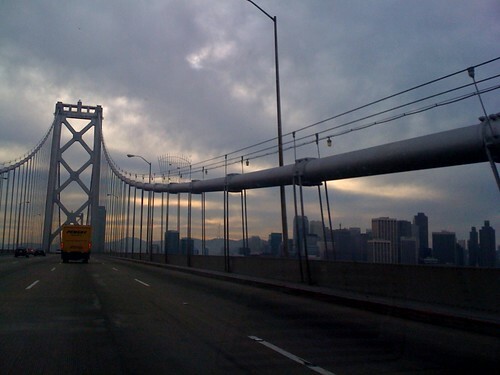 PERSONAL HISTORY about the writer’s years as an aspiring composer in San Francisco. … The writer’s plan was to live as a proletarian worker by day and an avant-garde composer at night. He worked unloading clothes from shipping containers. He wrote no music for a year and began falling into a depression. … [So he soon got a job at] the San Francisco Conservatory. The writer taught there for ten years, by fits and starts finding his voice as a composer. On a personal note, I have a friend who tried that proletarian approach too, though without the Marxist pretensions; he lasted on the Oakland waterfront just long enough for a hernia to force him to do something else. He’s gone into a profession that is similarly friendly to composition: freelance software coding. If you don’t have a copy of the issue, this 15-minute episode of the The New Yorker Out Loud features John Adams discussing his career, and in the process he hits all the main points in the article. Plus there’s background music. (Phrygian Gates!) Now I’m never going to be able to go past the south windmill at the western end of Golden Gate Park without thinking of John Adams, as he apparently lived about two blocks from there.